Alberta's Curriculum/Program of Studies are derived from Western and Northern Canadian Protocol For Collaboration in Basic Education (the Common Curriculum Framework). It is important to note that the Mathematics component slightly differs from that of the WNCP (click here to discover the differences). Whilst undertaking an analysis of Alberta's Curriculum/Program of Studies, it was heartening to see a curriculum authority (Education Alberta), create a more user-friendly curricula when compared to Australia and England. Naturally the curricula is again present in black and white text, however, when compared to the curricula documents from Australia and England, progression/differentiation is much easier to detect (particularly in The Alberta K-9 Mathematics Program of Studies with Achievement Indicators) as the curricula is presented in tabular format (pictured below). It was also great to see that approximately 70% of the Mathematics Specific Outcomes are aligned so that on the most part, a statement relating to the same or similar mathematical area can be found for the preceding or following Grade by scrolling left or right. 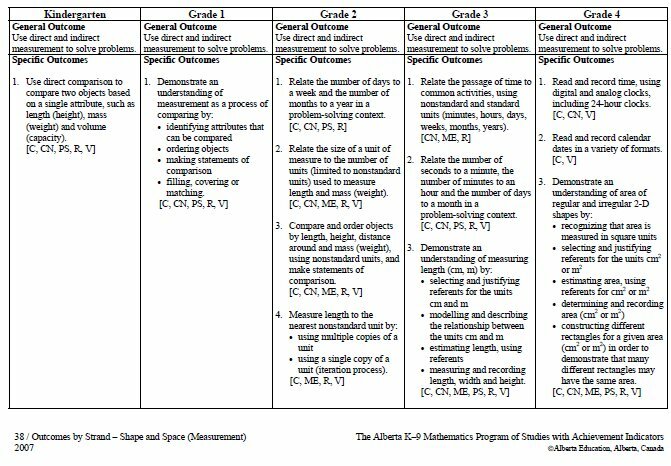 The Progressive Curriculum Frameworks For Alberta's Program of Studies is a word-by-word replica of the current English and Mathematics curriculum documents that contains a colour-coding and physical alignment/augmentation of the specific outcomes that identifies progression/differentiation. 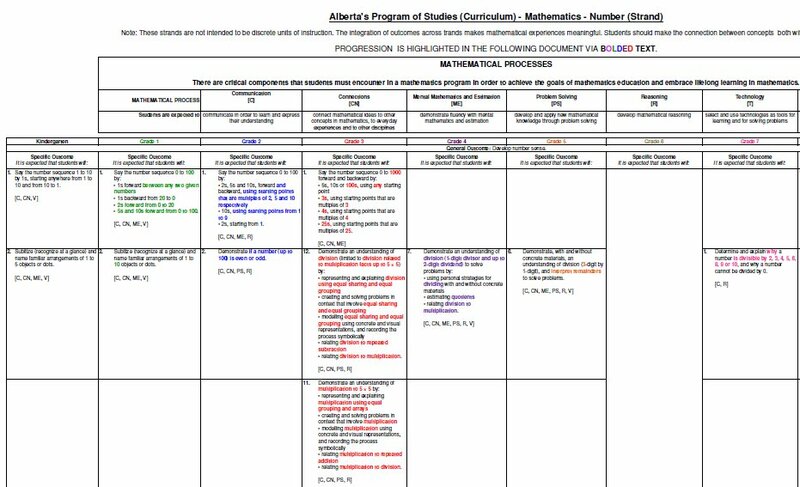 A screenshot of each of the two derivations of The Progressive Curriculum Framework for Alberta's K-9 Program of Studies for English Language Arts & Mathematics (one with Achievement Indicators, one without) and then download the documentation from the downloads section below. Note: Each document can be downloaded or viewed in a larger manner by clicking on each image below. How Can 'Progressive' Curriculum Frameworks Be Implemented in Canadian/Alberta's Schools? Assessment: Teachers can eliminate Pre and Post Tests by using Progressive Capacity Matrices. Reporting (Student-lead): Students can create their own hyperlinks within the frameworks to open student work samples during student-led conferencing. A variety of online tutorials explaining and demonstrating how educators can use curriculum documents that contain a progressive analysis (as outlined above) can be accessed here. Examples of how various schools in Australia have implemented The Progressive Curriculum Frameworks can be accessed from here. Permission has been given by Alberta Education to reproduce and distribute the following content under the conditions that the outcomes are not altered; that appropriate credit/citation is included and that the material is used solely for non-profit, educational purposes. The downloads are available in PDF format. If you would like to have free access to the editable Excel files, please email Effective Curriculum Ideas. 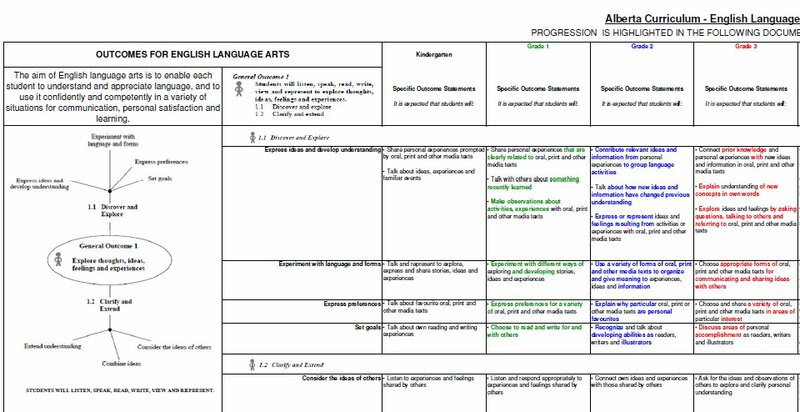 Alberta's Program of Studies - Progressive Framework - English Language Arts (K-9) - Sample 2 - With "W" Indicators (Identifying specific outcomes that directly or indirectly related to Writing, Reading, Speaking and/or Listening). I was asked if I would like to attend and also present at InnovateWest, a conference for innovative educators hosted by Connect Charter School in Calgary on 23-25 May, 2014. The introduction of how a progressive analysis was applied to Alberta's Program of Studies and how this analysis technique could then be freely applied to any country or provincial curricula. Specialist teachers in secondary school scenarios could use a modified approach to using colour to identifying progression/differentiation based on the approach that I had used when analysing Australia's Science (P1, P2, P3), History, Geography, Digital Technologies (ICT), Business & Economics and Civics & Citizenship curricula. Comment at Alberta's Inspired Curriculum forum. Login here. Comment at the Effective Curriculum Ideas Blog. Note: The above Creative Commons License only applies to the typed content on this page and does not apply to any text or images contained within Alberta's Program of Studies (which is protected under different copyright laws).